The MX 915 is designed to engage consumers in new ways with its full-motion video display and slim, space-saving design. It captures consumers’ attention without adding to lane or countertop clutter. The MX 915 delivers a rich media experience with a clear, 4.3″ color display, high-speed processor and generous memory. This elegantly designed, sleek and space-saving unit supports full-motion video — driving new revenue opportunities while enhancing customer interaction. It is NFC-enabled to capitalize on the coming wave of smartphone transactions, in addition to supporting EMV-approved chip and PIN payments. The MX 915 is a complete media solution that garners profitable consumer attention. The MX 915 colorful display brings customer messaging, advertising and video campaigns to life. Its clean lines and sleek design make a powerful statement at the point of sale — in the lane or on a countertop. Quickly capture new markets as they evolve with the MX 915’s contactless payment capabilities. 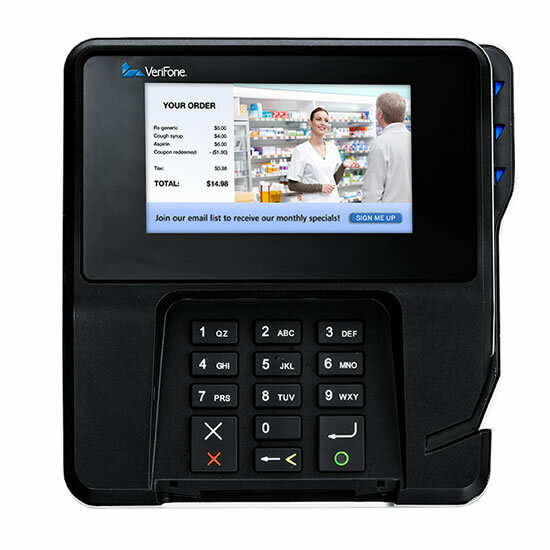 Its integrated, tactile backlit keypad speeds customers through lanes while reducing errors. The MX 915 is an ideal platform for a variety of value-added services such as administering loyalty programs, gift card issuance and top-up services. © 2016 Trintas. All rights reserved.